Biography of Irish Impressionist, Landscape Artist, Genre Painter & Portraitist. One of the top Irish exponents of Impressionism, and Post-Impressionism, although he died before achieving his full potential as an artist, his early works were outdoor paintings of rural scenes These were followed by a series of Impressionistic figure paintings focusing on subjects like women, small children and old people. His works remain in great demand by art-collectors. Walter Frederick Osborne, the son of William Osborne another artist, was born in Dublin, in 1859. Taught drawing and painting by his father, he studied figure drawing at the Academie Royale des Beaux Arts in Antwerp. While at Antwerp he won the prestigious Irish Taylor Prize in 1881 and again in 1882. From Antwerp, Osborne, like fellow Irish artists Nathaniel Hill, Roderic O'Conor and Joseph Kavanagh, went to paint in Brittany, France, where he developed a naturalist style of Impressionist landscape painting, focusing on farmyards, orchards and Breton scenes. It was here that he completed his famous Apple Gathering, which now hangs in the National Gallery of Ireland. It shows two girls in traditional Breton costume gathering apples, against a background of Quimperle roofs. Notice its atmospheric palette of rich greens, grays and slate blues, with touches of pink and white, and the subtle shadows beneath the trees. After two years in Brittany, Osborne moved to England in 1884, where he continued with his plein air painting. Returning to Dublin in the early 1890's, his landscape painting and figurative scenes began to show a marked Impressionistic influence. His dark palette gave way to brighter colours and he demonstrated an increasing interest in sunlight and shadow. For more about the French style of Impressionism, please see: Characteristics of Impressionist Painting 1870-1910. After 3 years, his Dublin painting practice became so successful, he was obliged to move to a large studio at St. Stephens Green. Moving away from landscapes, his main focus became portrait art. In his perception of women, children, old people and so on, and in his delicate handling of paint, Osborne's 'Impressionism' is closer to that of Berthe Morisot, and perhaps Renoir and Monet. In addition, he did genre-painting of the local Dublin streets and in the surrounding countryside and made occasional forays to paint in the West of Ireland. Sadly, Walter Osborne died prematurely from pneumonia, at the age of 43, when on the brink of maturity as an artist. His final work "Tea in the Garden", a beautiful combination of naturalism and impressionism, remained unfinished at his death. He remains a major influence in the visual art of Ireland. 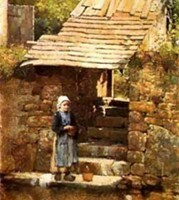 Breton Girl By The River (1883) is a masterful demonstration of the use of reds and browns to convey the colour and texture of the Breton brickwork. The shadows on the steps are painstakingly reproduced although the painting lacks finish in its capture of sunlight and water. 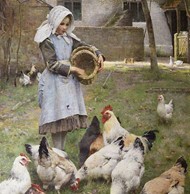 Walter Osborne remains one of the most sought after artists by Irish collectors. The auction record for a work by Osborne was set in 2001, when his genre painting, entitled In the Garden, Castlewood Avenue (1901), was sold at James Adams, in Dublin, for €825,330. In 2008, Osborne's Portrait of Dorothy And Irene Falkiner sold at Sotheby's for £580,500. For more about Irish record-breaking artworks, see: Most Expensive Irish Paintings.  For details of other impressionist painters in Ireland, see: Irish Artists: Paintings and Biographies.  For more about Impressionists like Walter Osborne, see: Irish Art Guide.  For more about French Impressionism, see: Homepage.